WHAT IS IDENTITY THE FT? Identity theft happens whenever someone uses your personal identification to commit fraud or other types of crimes. They may use your name, credit card number, or your Social Security number (or other identifying information). According to the Federal Trade Commission (FTC) in the United States, some 9 million Americans have their identities stolen every year. They also state that identity theft is likely to affect most people in some way. The thief may rent an apartment using someone else's name. He/She may open a line of credit or use your own line of credit for his/her buying needs. He/She may apply for a job using your identification. The effects of identity theft are very real. Your credit may be destroyed. You may have more debt than you should. You may be denied school loans or other types of loans due to poor credit or overuse of credit. You may even lose out on job opportunities if the case becomes severe enough. The good news is that this very serious problem does have solutions. You may not even know about the problem until a debt collector calls you about a debt you do not remember creating. In other situations, you may spot the minor problems right away. In many cases, the victims of identity theft can solve their problems quickly by being vigilant both online and offline. These crimes are punishable by jail time and the repayment of funds. Unfortunately, the road to getting your credit repaired and getting your debts worked out is rarely as easy to accomplish. 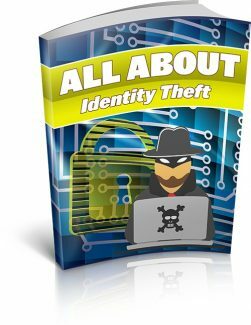 There are many ways in which identity theft can happen. Most of the time, you will not be making big mistakes such as handing over your personal information. Rather, it may be small things that you do not think of or realize that can allow for someone to get your information. Still, by knowing how this happens, you will be able to prevent further occurrences. - Phishing: One of the most common and hard-to-spot methods is phishing. Here, the identity thief pretends to be a credit card company, bank, or even an online payment service like PayPal or eBay. They send you messages through email or even pop-up messages when you visit websites. They claim that you need to verify information or that your account has been put on hold. The goal that they have is simply to get you to log into your account through their website so that they can steal your personal information. - Dumpster Diving: While it may sound like something that would never happen, dumpster diving is also a commonly used method for getting your personal information. They look through trash for bills that contain personal information. This may be done when you put your trash out or when you toss information at work. - Skimming Methods: Skimming is a clever method in that it is very hard to detect. Imagine going to a restaurant for dinner. You hand over your credit card to the waiter. If the waiter has a skimming device, they could swipe your card through it, which then allows them access to your information. They can later use that information to make purchases on your account. These special storage devices can be hard to detect. - Stealing Via The Old-Fashioned Ways: Of course, stealing your personal information may be done in any number of ways, including the old-fashioned way. They may steal your wallet or purse. They may take your mail. Pre-approved credit card offers can easily be used by them. They may take personal records or even bribe employees to provide this information to them. - Address Changes: Some criminals will change your address at the post office. They forward your mail to their address in the hopes of stealing some of your personal information in the process. All it takes is filling out a change of address form. - Pretexting: By pretending to be a merchant, your banker, or a telephone salesperson, identity thieves can easily take your information and use it for their own purposes. It is essential to ensure you know whom you are talking to and to make them verify it! There may be other methods by which they can steal your personal information as well. It is up to you to do the best you can to find out what they are doing and to work to stop the process. HOW DO THEY USE STOLEN INFORMATION? Now that they have your name, Social Security number, your credit card numbers, your address or other information, they can use it in various ways to steal from you. One of the most common methods of using stolen information is credit card fraud. Here, the thief may simply use your own information, such as the credit card itself, to make purchases. He/She may also use the information he/she has obtained to open new credit card accounts in your name. He/She does not pay the bills, which causes these accounts to become delinquent (in your name). They end up on your credit report as well. Another form of credit card fraud occurs when the identity thieves steal your information, change the address on your credit card statements, and then use the information to run up the bills on already-existing credit cards. You no longer get the bill, but you likely do not realize it for some time. Phone or utility fraud is yet another common problem associated with identity theft. Here, they may obtain a new mobile phone or even other utilities in your name. They use those accounts, never paying the bills on them, and run up the charges. Sometimes, they may be able to access your current information so that they can use that to their own advantage.